The bach is a ten minute walk from the lake. Wonderful views of the lake and mountains can be seen from the extensive deck. Shops are within walking distance, the town centre is a short drive and De Brett hot pools are closeby. The bach gets all day sun during summer and a wood fire keeps it really warm in winter time. There is a double garage and plenty of off street parking. The garden is fully fenced and safe for children and pets. The Lion's walk around the lake shore can be enjoyed by children and dogs. Steam rising from the hot water beach can be seen from the lakeside. Please inquire the tarriff for event weekends. A further reduction in tarriff will apply for a stay of more than 7 nights. Please ensure that the awnings are not left out. Basic pantry items are not supplied. Families preferred. I am a retired school teacher. I enjoy walking, travelling, time with my family and I also do patchwork and quilting. 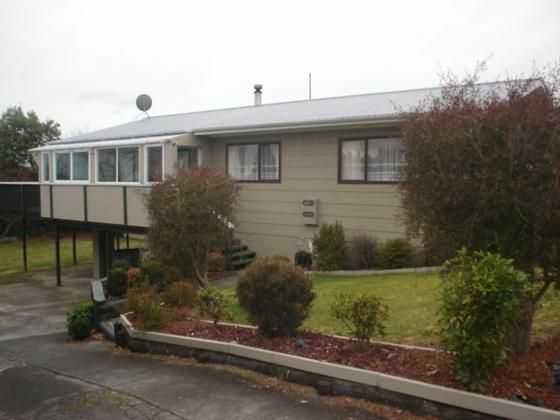 This property is suitable for retirees, young families and people doing contract work in Taupo. The airport, shops and lake are nearby. Heated towel rail. Shower over bath. Mirror above bathroom cupboard. One electric heater, please turn off when you go out. Front loader, please use liquid detergent. Drying rack stored in the laundry room. Ample room under deck and on driveway. Room for two cars, can be locked. Wood stored in shed near back door. Matches and firelighters are kept in corner cupboard in the kitchen. Fire guard found in covered porch. Please clean and place ash in metal bin outside. Two seater couch and two single chairs. Coffee table, side table with fan and flat screen TV. Free standing with adequate freezer compartment. Free standing electric stove with oven and warming drawer. Single electric oven is part of the stove. Electric toaster for 2 slices of bread. Plates, side plates, bowls, glasses, mugs and large dishes for cooking and serving food. Pots and pans in drawers. Cutlery and various kitchen utensils. Plenty of storage in cupboards which contain crockery, glasses and plastic wear. Ample lighting. Circular table seats four. Table mats and coasters provided. Please operate manually, the remote is used to operate the Freeview box attached to the back of the TV. Select channel on TV manually and use small remote to operate DVD player. Fully fenced, please supervise young children. Large area, with washing line. Please supervise young children. We had a nice week away and the property was great, very spacious and in a good location. Taupo is a great place for a holiday. Nice garden, terrace and big house. Short drive into town and to the lake. Spacious, good, secure garden, close to shops, easy to get to the lake and the town. Simple, tidy bach that suits us very well. An ideal location which combines outdoor activities with the modern amenities the town has to offer.